Great. Also post a new HijackThis log. What do you mean by not being able to access Virustotal on the computer? What problems do you have left? The girls are probably still dancing on your desktop, aren't they. Don't worry; they'll be fixed in the next step, after you've posted the virustotal results. Please follow all my instructions accordingly. Read through all of it. â€¢ Click on Misc Tools. â€¢ Then click Open Uninstall Manager. â€¢ Notepad will open with the list. â€¢ Post the list here. Please disable all security programs, such as antiviruses, antispywares, and firewalls. Also disable your internet connection. Save this as CFScript.txt in the same folder as ComboFix. Then drag the CFScript.txt into Combo-Fix.exe. This will start ComboFix again. After reboot, (in case it asks to reboot), post the ComboFix log here. The log will be located at C:\ComboFix(.txt). Do not click on the ComoboFix window, as it may cause it to stall. Also turn on the computer and tell me what problems are left. I don't notice any problems with the computer. You can uninstall VirtuaGirl HD from your Add/Remove Programs in the Control Panel. This will make the dancing girls go away, unless you installed this program and wish to keep it. I'll post back soon with more information for the future security of your computer. 2. Now Set a New Restore Point to prevent possible re-infection from an old one. Some of the malware you picked up could have been saved in System Restore. Since System Restore is a protected directory, your tools can not access it to delete these bad files which sometimes can re-infect your system. Setting a new restore point AFTER cleaning your system will help prevent this and enable your computer to "roll-back" to a clean working state. â€¢ Go to Start > Programs > Accessories > System Tools and click "System Restore". 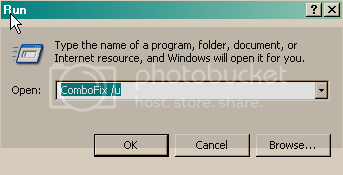 â€¢ Choose the radio button marked "Create a Restore Point" on the first screen then click "Next". Give the R.P. a name then click "Create". The new point will be stamped with the current date and time. Keep a log of this so you can find it easily should you need to use System Restore. â€¢ Click the "More Options" Tab. â€¢ Click "Clean Up" in the System Restore section to remove all previous restore points except the newly created one. 2.Right-click the local disk volume that you want to defragment, and then click Properties. 3.On the Tools tab, click Defragment Now. To protect your machine, I highly recommend BOClean. Itâ€™s FREE and it works. I use it and never get one of these infections. Comodo BOClean protects your computer against trojans, malware and other threats. It constantly scans your system in the background and intercepts any recognized trojan activity. The program can ask the user what to do, or run in unattended mode and automatically shutdown and remove any suspected Trojan application. Comodo BOClean currently supports more than 60,000 malware items and offers automatic daily updates. Other features include updating via network share, tamper protection and stealth mode. See Slow Computer? It May Not Be Malware for free cleaning/maintenance tools to help keep your computer running smooth. Enjoy your clean computer. Any more questions?